Home » Personal Musings » In Love Again at My Age??? In Love Again at My Age??? That’s right. Who knew? At my age. A married woman. With her own family. I can’t believe I’m broadcasting this on a blog read by millions (okay – maybe not millions, but hundreds). 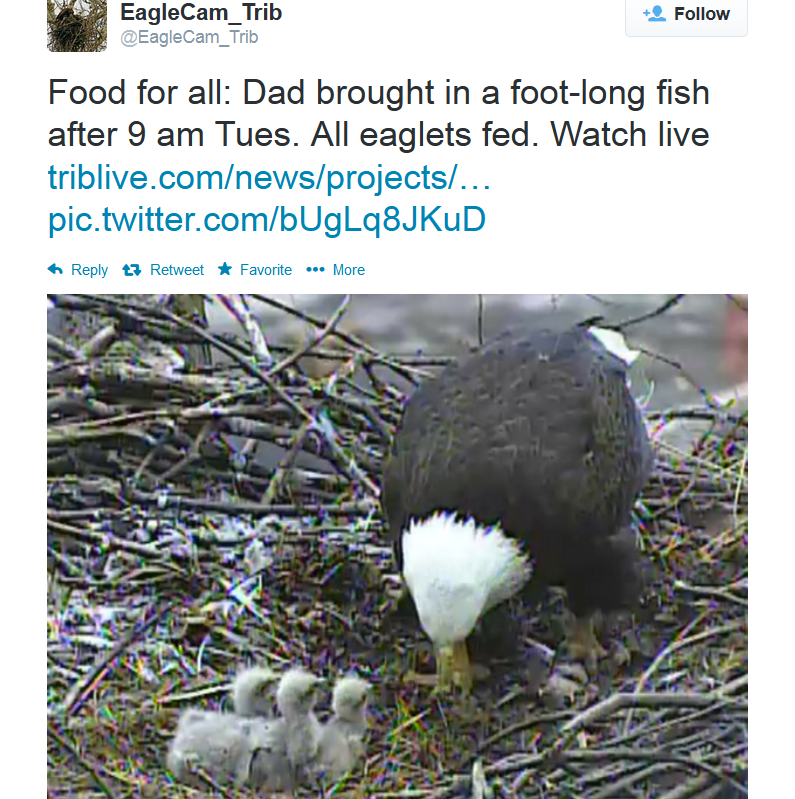 I’m in love with the Pittsburgh (Pennsylvania) Hays Bald Eagle Family, and I’m addicted to watching the live feed – the Pittsburgh Eagle Cam – sponsored by the Audubon Society of Western Pennsylvania. After an absence of more than 150 years, this bald eagle pair – the national bird of the United States – is nesting for the second year in the steel city of Pittsburgh, Pennsylvania. They’re in Pittsburgh because there’s food there. In fact, the near-by Monongahela River holds 76 species of fish. Much of an eagle’s diet consists of fish, although they also eat rabbits, squirrels, snakes, frogs and other small creatures, as well as scavenge dead animals. The current nest is their second, as last year’s nest collapsed from a near-by smaller tree. The Hays female is believed to be 5 1/2 years old. The Hays male is smaller (normally by about 25%) and for those of you watching the live feed, has a small white spot on his right side, near the tail. 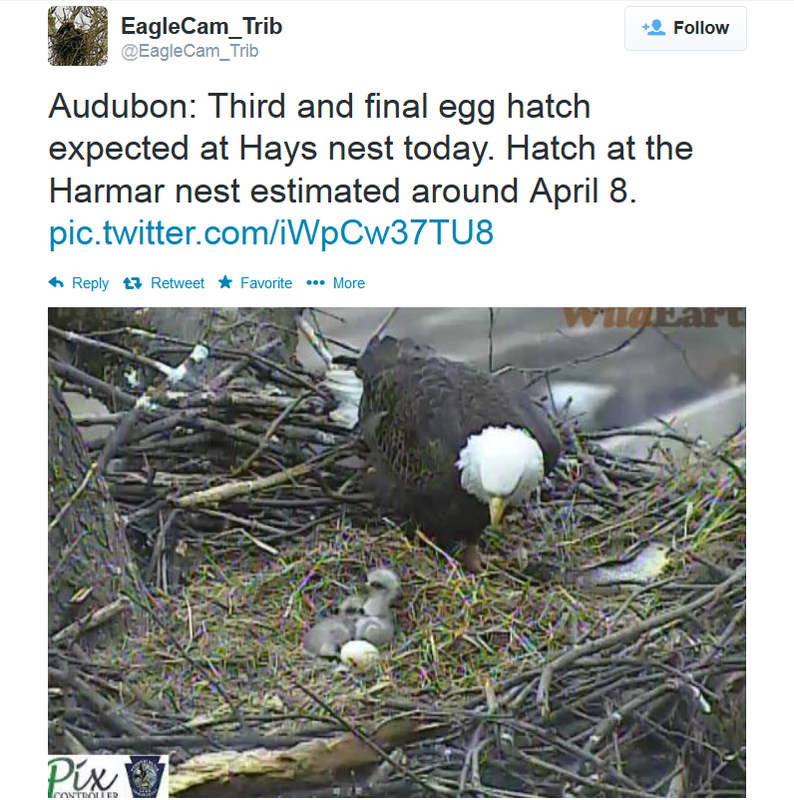 The eagle pair’s first egg was laid on Feb. 19th, followed by a second on Feb. 22nd and a third on Feb.25th. The Mom fended off attacks on the incubating eggs by a raccoon, a marauding raptor and a flying squirrel. The eggs hatched successfully on March 28th, 30th and April 3rd. Three surviving eaglets is unusual, and it is not uncommon for the oldest, especially if she’s a female, to kill the youngest, something with which the parents do not interfere. Because of the difference in size of the 3 eaglets, I find myself squirming whenever they are being fed as I watch the smallest get pushed out of the way by the ravenous older and bigger siblings. I’m on my desk chair, leaning back and forth, trying to help the tiniest eaglet position itself for maximum feeding. The Audubon Society of Western Pennsylvania needs to install a live feed in my office; I’d be (almost) more entertaining than the eagle cam! Sometimes during the feedings, I actually have to turn the live feed off (not for long), because I am that invested in the outcome of the tiniest eaglet’s welfare. Worrying that I will actually see it killed, or pushed out of the nest, or waste away to skeletal proportions is far too stressful for this human who gets a neck and shoulder massage every 2 weeks with little relief. Plus, whenever the Dad brings the latest hard-won food offering to his family – a gleaming trout, a chubby squab, a cute (unidentified) furry mammal – I have to keep singing Disney’s “The Circle of Life” in order to not dwell too much on the fact that something gave up its life so that the adorable eaglets might live. Just when I calm down, I see on one of my many bookmarked eagle websites that approximately 40% of young eagles do not survive their first flight, and I am back to being the worried, over-protective mother. Whew – watching this eagle cam is hard work! 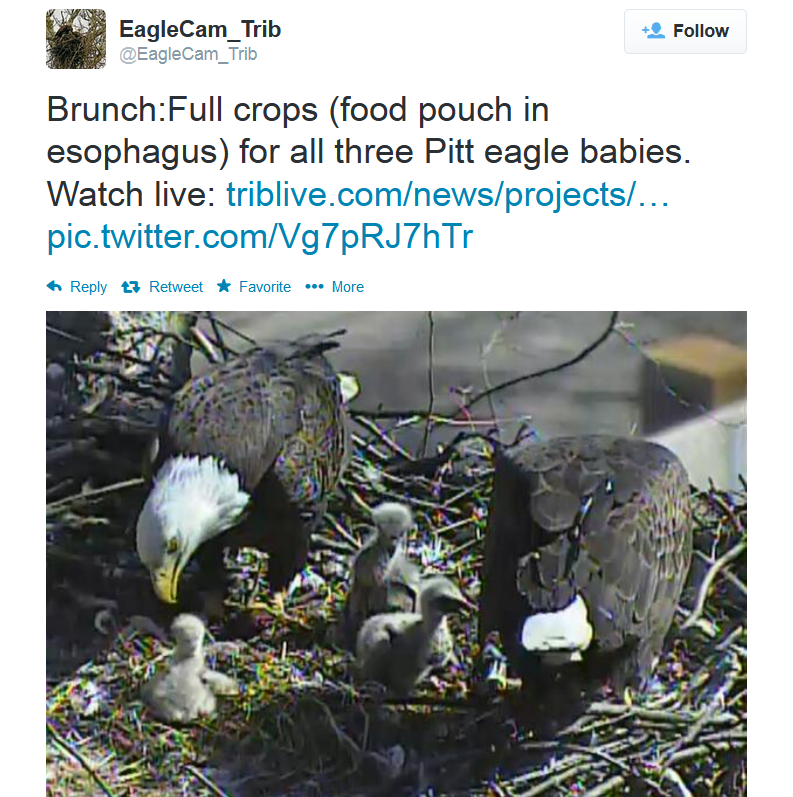 A week ago – and this is not a joke – I woke up from a bad dream where I was trying to save the eaglets from a rabid dog that kept climbing the tree to attack the babies. In the dream, I put together some kind of animal trap to catch the predator, but he kept outsmarting me as I perched precariously on a tree limb near the huge, foul-smelling nest. (Yes, I not only dream in color, but have the added benefit of smell-o-vision as well). I woke up before the rabid dog reached the eaglets. So, dear readers, I’m in love again. It could be worse. I could be addicted to watching reality TV shows or soap operas or the Weather Channel. And just because I no longer cook or clean for my own family because I’m keeping watch over my second family doesn’t mean I’m a bad person. I’m just a woman in love. Love this! ❤ ! i am missing Pittsburgh, and I love both your fascination and your investment! ❤ Long live the eagle family! Thank you for this wonderful post. I’m also addicted to watching the live feed I adore it ! Elisabeth – thank you for checking out the live feed. It’s much better viewing in the daytime; today it was actually snowing and the Mom was keeping the eaglets under her most of the day. Right now, I think the Mom and Dad are both sleeping – I’ve never seen that happen before. Blessings and warm regards, Elisabeth. This is a really splendid piece of writing. I think you should try to get it published in the newspaper. Really! Wow, Eliza – from your lips to a newspaper editor’s ears… Thank you!!! You’re welcome, Eddie. Your following the link is appreciated! I was not going to go see it… yet, I had to! Gee – I’ve never been called a goddess, let alone an Earth Goddess. From the looks of your list, I’m in good company. With gratitude and blessings for saying a public Namaste to Soul Gatherings… Congratulations on your award – here’s to the blogging Sisterhood! Thank you for giving me permission to fore-go the housework; now back to the eaglets! What a fabulous post- the title drew me in and your writing kept me interested until the object of your love got me totally hooked. A brilliant post x thank you!